I plan to review relevant products from time-to-time so please feel free to send them through. Here’s my first attempt….. In the last couple of weeks I’ve been testing the Fizik Vesta Women’s Saddle which is going pretty well. It looks and feels good so far and is definitely one I would consider if you’re looking for a women-specific saddle for your road bike. I’m not an expert on saddles but from what I know women’s saddles are made differently to men’s to accommodate our anatomy. They often have more padding than men’s and are usually wider at the back because women’s sit bones are wider. My Specialized bike has a Specialized Ruby Expert women’s saddle which is also good but a little on the hard side at times, particularly on those long rides. My old bike had a more cushioned women’s saddle – Selle Italia Gel Flow and when I hopped on it a couple of weeks ago I certainly noticed how spongy it felt. The Fizik Vesta is about half way between the two – not too hard, not too soft – just right. It also looks good. The test seat I’ve been given is the grey and white version. It is also available in black. The grey part which goes up the middle is a suede-like fabric that Fizik calls Microtex and the outer part is white leather-like covering. When I first saw it I thought the grey part might mark easily but I’ve already ridden with it in the rain and it still looks brand new so it obviously wears ok. The only criticism I have is that I couldn’t fit my Topeak bike bag bracket underneath the seat because the rails didn’t line up with the bracket so I had to go with another bike bag but it wasn’t a big issue. Lucky we’ve got so much riding gear that we had a spare one that clips under instead. I was impressed to read on the packaging that it’s handmade in Italy and weighs only 269 grams. 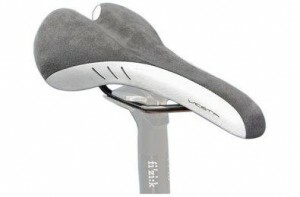 The Fizik saddles are widely available through bike retailers. I noticed when I was in Clarence Street Cyclery women’s store a couple of weeks ago that they stock it and also have a test saddle that you can borrow to try it out – definitely a good idea. The RRP is $189 and I’d certainly recommend you put it on your short-list if you’re looking to upgrade your saddle. Hey thanks for that. I have a Ruby Expert as well and I have always liked it, but with one complaint – a little too wide between the legs ;). It is now a bit old and I have started looking for a new one so your review is particularly interesting to me. Thanks!